2018 is halfway done, and this means that we are that much closer to the selection of the 2018 Reader’s choice winners for the Dallas Observer. This means that the people of Dallas have until September 10, 2018 to vote on the city’s best selection of restaurants, bars, shopping, and Texas entertainment. This year, Y.O. Ranch Steakhouse has the honor of being nominated for the “Best Chicken Fried Steak In Dallas.” Before you get out and cast your vote for us, here are some facts about our Chicken Fried Steak that will solidify your decision. Chicken Fried Steak is Important Business! Food is what brings people together in a community, and this dish is one that knows how to bring a group around the dining table. Chicken Fried Steak is a culinary creation that is simply synonymous with the South and our great city of Dallas. Heck, the dish even originated in Texas back in 1911, when Jimmy Don Perkins has been claimed to have invented the dish on accident. Let’s face it, even though Chicken Fried Steak is a simple dish that consists of breaded and fried meat, it is a Texas staple that even the highest class steakhouse in downtown Dallas would be proud to serve for any customer. Why Vote For Our Chicken Fried Steak? The beauty of the Chicken Fried Steak is all in how it can be prepared. From the spices to the actual sides and toppings available at a restaurant, everyone has their own rendition of this classic. So, of all the steakhouses in Dallas, why vote for our Chicken Fried Steak? The answer is simple; quality. No matter the dish, any cut of meat that is served to a guest at our steakhouse comes fresh from the official Y.O. Ranch. Our menu doesn’t deal in frozen and ordered meats at our steakhouse. Since our doors have opened to the public, we have always prided ourselves on serving the freshest, highest-quality cuts to go with our mouthwatering sides. 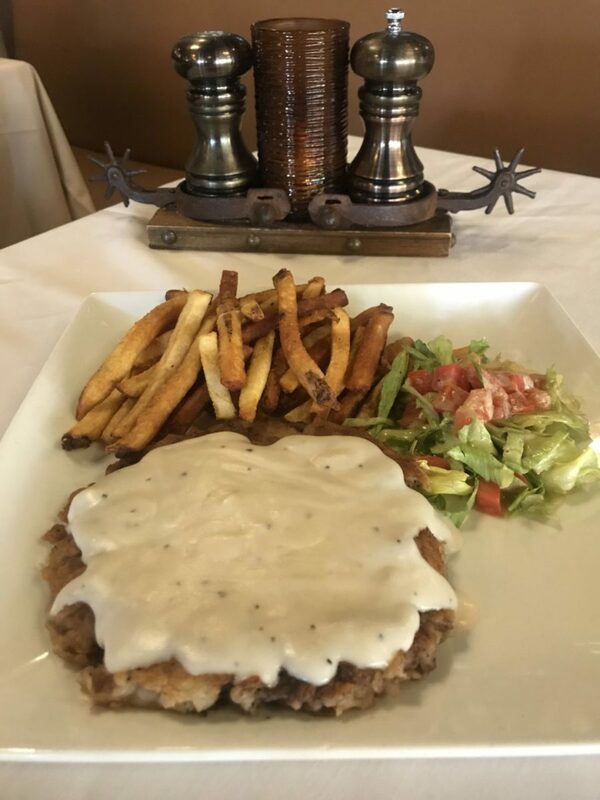 Chicken Fried Steak is no exception, and we can guarantee that your first bite into our serving will be exceptional. What Does it Mean to Us to Win? Being the best of any dish in our city is a huge honor to us. However, what’s even more important is being able to spread our love for Chicken Fried Steak and Texas cuisine beyond the West End. Seeing the smile on the face of someone who is enjoying our intimate dining area, classic drinks, and unique food means more to us than any title. Bringing our community together is what counts, and being named “Best Chicken Fried Steak” in the Dallas Observer brings us one step closer to our ultimate goal. Voting us the best in Dallas alone doesn’t give you the chance to reap the benefits of us winning. Come by our restaurant in the West End today to find out why our Chicken Fried Steak is award-worthy. Don’t miss your chance to make a reservation today!